You would have thought that after so many decades there was little more to say about the Star Trek universe. Christmas, however, has a way of bringing yet more books to the fore. Star Trek: The Book of Lists (2017. 223 pages. 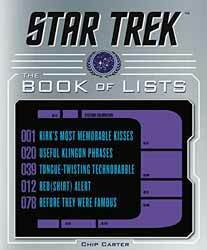 7×9 hardcover), written by Chip Carter, offers up one hundred lists referring to all things Trek, covering all the shows as well as the films, including the Kelvin timeline but not Discovery. The lists are categorised and range from the semi-serious, "Memorable Deaths" to the lighter hearted "Famous Star Trek Fans". By design the book is meant to be browsed, rather than read cover to cover. As such, it concentrates more on breadth than depth. That is not to say that is does not contain a few nuggets of information which some diehard fans may find interesting like the connections between the original series and the 1966 Batman show. Also, there are a large number of colour plates. The book is a nice format for the information contained within. Some elements, like the lists of best and worst episode may provoke debate, which is the real reason for their creation, but otherwise it’s a nice book for the novice trekkie.